ATTENDANCE – we will need at least 90 people to be there or have sent a proxy to have quorum and to allow the meeting to occur. With the growth in our neighborhood, your attendance is now more important than ever. Please make plans to attend or send in your proxy ballot. PROXY BALLOT – Meeting notices and proxy ballots have been mailed to all owners. If you are unable to attend, please make certain to give your proxy to a neighbor you trust to vote on your behalf. ELECTION OF BOARD MEMBERS – We will be electing 3 new resident board members at this meeting, which will give our residents complete control of community operations. We have been accepting nominations for representatives for some time and their bio is provided in the March newsletter (and below) for your review. Nominations for residential board members will also be accepted from the floor at the annual meeting. If you are still interested in nomination yourself or someone you know, please contact our property manager, Jim Smitherman – jim.smitherman@goodwintx.com – for an interest form. The following individuals submitted their interest form along with a bio for residents to consider during voting at the annual meeting. Please note that nominations are still being accepted and will be accepted at the meeting. 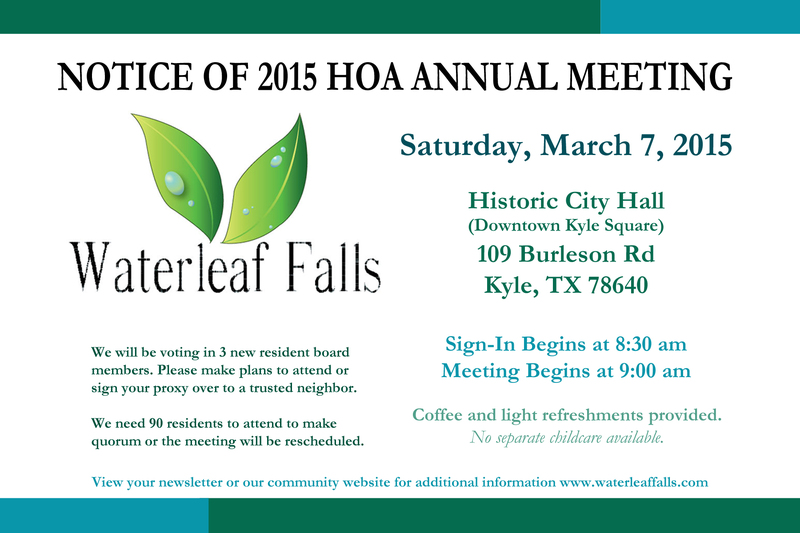 Make plans to attend to cast your vote for a residential representative on your HOA Board of Directors. Darla Damron is a devoted wife and mother of seven children. She was born and raised in the Austin, Texas area. She graduated from Lockhart ISD, Lockhart, TX. She attended Sul Ross State University and Southwest Texas State University. She also took continuing education courses at De Anza College and West Valley College in California. She lived in California for 21 years until she and her family moved to Kyle, TX in 2008. She and her family have lived in the Waterleaf neighborhood since September 2009. In the past six years she has served on several Waterleaf Falls HOA committees, including Co-chair on the first Core Committee, Social Committee, Welcome Committee, Pool Committee, and Yard-of-the-Month Committee. She has worked for Lockhart Independent School District as the Superintendent/School Board Secretary for six years. As their Secretary she supports the Superintendent of Schools and supports the Board of Education by preparing for bi-monthly School Board meetings. Darla enjoys spending time with her family, reading, camping, hiking, walking, and traveling to California to visit her older children. She is an active member in her church. She loves serving and feels that serving others is the best way to make a person and a community stronger. My name is Megan Honick; Chris whom has been my wonderful husband of 8 years and also a beautiful daughter Ashley that is 6 years old and you may have seen her around selling the Famous Girl Scout Cookies. My Family and I moved here from Las Vegas, Nv almost 2 years ago, we had an opportunity to better my daughter’s life and ours by moving to the Wonderful state of Texas and we chose Kyle for better schooling as well as the Best communities around. I have been the Social Committee Chair for about 6 months now and I feel like I can do more to help my extended family! I would be Honored to be your voice of the Waterleaf Community and make it the Best in Kyle! Jason and his family have lived in Waterleaf Falls for 2.5 years. In that time, he has served as a Neighborhood Watch Committee Chair and was part of the task force that reviewed and amended the HOA by-laws in 2013. He was appointed to the Board in December 2014 to fill a position left vacant by the resignation of one the KB members. My name is Angela McGrady and I moved to Waterleaf Falls in March of 2011. We relocated to Kyle in July of 2008 from Atlanta, GA. My family consists of my husband, Jason, my five-year-old son, Zander and our three-year-old Chug (Chihuahua/Pug mix) Kahlua. We selected this area because we liked the small town feel of Kyle and were accustomed to living in the suburbs of a large city. Waterleaf seemed the perfect choice and we have grown to love our friends and neighbors, who call it home. I have been very involved in the community since early 2012, when I became a Chair of the Social Committee. I love meeting neighbors and helping with activities. However, my strengths are more in communication, writing, and organization, so in 2013 I joined the Communication Committee as a Chair. In addition to aiding my co-chair in the newsletter, signage, and website, I also act as a Moderator on the Waterleaf Subdivision Facebook Group. I help to ensure that accurate information is shared with the community and all residents have a respectful avenue in which to share information. One of my passions is to volunteer with non-profit groups. I have assisted PAWS Animal Shelter and Humane Society in a pet micro-chipping event in Waterleaf, and would like to plan another this spring. My position in Commercial Real Estate affords me the opportunity to work with and support local organizations, so I am no stranger to volunteering my time, and by electing me as a director to the Board, I will serve Waterleaf with the same enthusiasm and effort that I offer to all of my organizations. In closing, I hope that you would consider me a strong candidate for this position. My education, experience, and skills would lend well to this appointment and I would like to see the community have a smooth transition from developer-run to resident-led board.